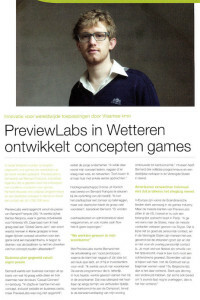 This month, the story of how PreviewLabs started is covered in Ondernemers (translated: ‘Entrepreneurs’), the magazine of Voka, a major employers’ organisation in Flanders. For our English speaking readership, here’s a translation of some key points from the article. Bernard devised a business concept based on what he would like to do, and went to the trade show ‘Casual Connect‘ in Hamburg. “I went there with a concept, including website and business cards, but PreviewLabs wasn’t yet officially founded”, the young entrepreneur explains. “I mainly wanted to test my concept, verify if there’s any demand, and network.”. “The first programmer added to the team literally worked in-house, with me in the living room. This was of course not feasible in the longer term: we temporarily moved to an office in Ghent, while I renovated the ground floor of my house to a proper office.” Meanwhile, Bernard has three full time programmers on the payroll and is working with a sales agent in the United States. In a very short time, we make [a game concept] playable, allowing the client to verify whether it’s a good concept. It’s a proof of concept, a feasibility study. It’s precisely this first phase – elaborating a concept while starting from scratch – which fascinates me endlessly. What we do is very varied and challenging. It’s also an interactive process: by collaborating with the client, and based on the client’s feedback, the final concept is established. 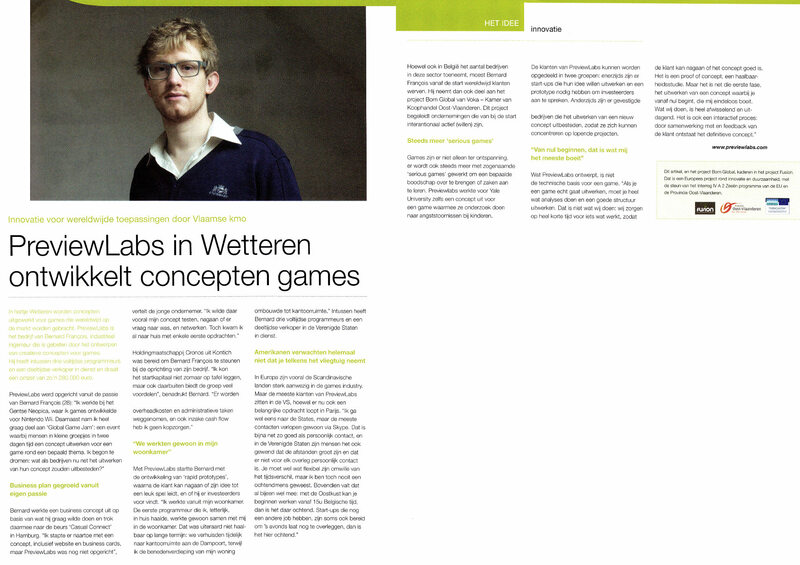 We didn’t become an authority on rapid game prototyping from one day to the next; every successful company has a passionate origin story and ours was recently featured in the Dutch magazine Ondernemers. Read on for some highlights of our short yet thriving history. You can read the full story here (in Dutch).